It’s sunny Saturday at Phoenix International Raceway for the Double Header – the Desert Diamond West Valley Phoenix Grand Prix and the Indy Lights Grand Prix of Phoenix. It’s warm with a nice breeze tempering the eighties temperature. 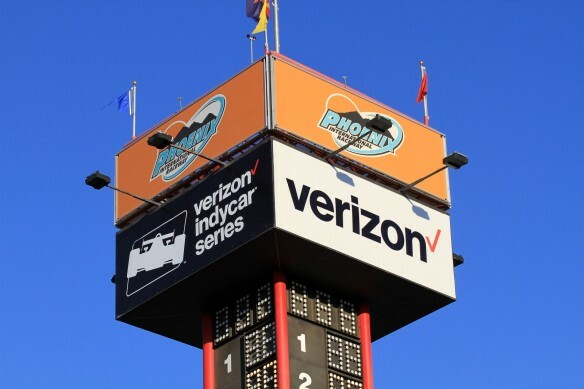 The IndyCar race is scheduled to start at 5:30pm local time and run for 250 laps on the tri-oval measuring 1.022 miles. It’s being televised live on NBCSN. Kyle Kaiser/No.18 Juncos Racing won the Indy Lights race, leading flag to flag. He also picked up all the Bonus points – fastest lap and most laps led. 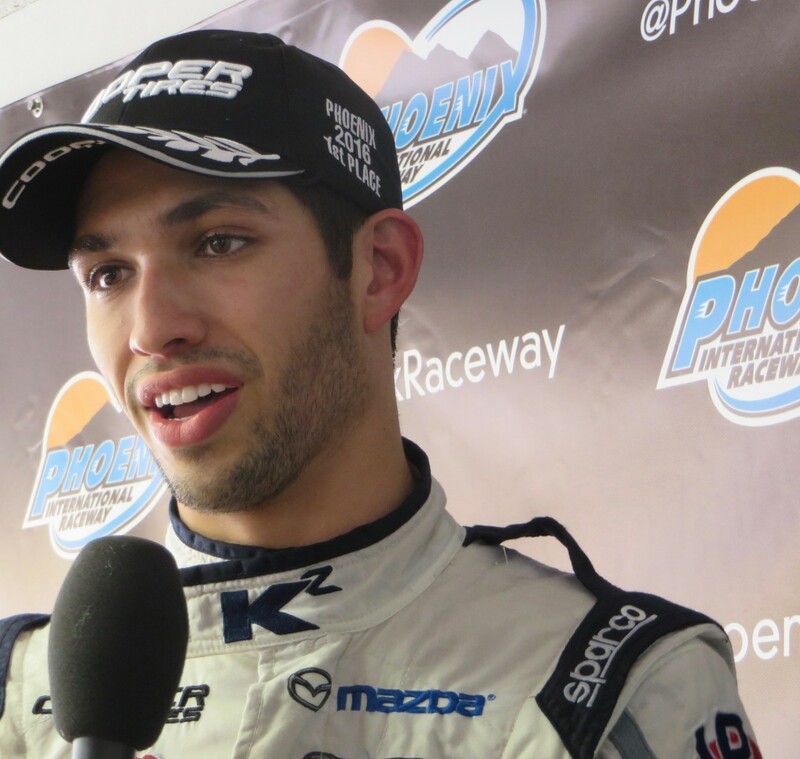 Going into the race, Kaiser was tied for the lead with Felix Serrales/No.4 Carlin. Now Kaiser is alone at the top of the standings, with 78 points. Second in the race was Ed Jones/No.11 Carlin; followed by RC Enerson/No.7 and Schmidt Peterson Motorsports w/Curb-Agajanian teammate, Rookie Santiago Urrutia/No.55; and Dean Stoneman/No.27 Andretti Autosport. The battle for third was the drama in the race, with the Schmidt Peterson teammates battling, acing out Serralles who finished seventh after starting fifth. 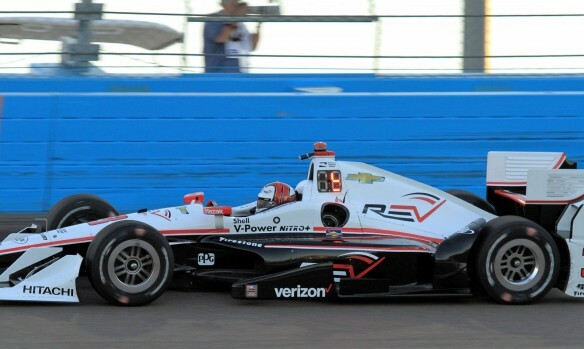 Serralles is second in the standings with 64 points, Rookie Felix Rosenqvist/No.14 Belardi Auto Racing (who finished fifteenth is third with 53 points, and Jones is fourth with 50 points. In the IndyCar garage the ABC Supply A.J. 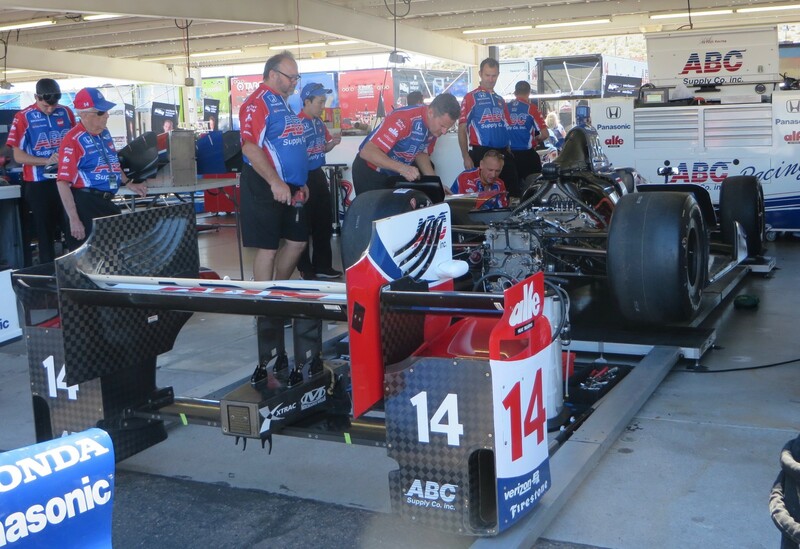 Foyt team beavered away on the No.14 Honda of Takuma Sato, repairing the damage suffered when Sato crashed in Turn Two during the first Friday practice. He was unhurt, but the car hit rear/sidewise and required major work. 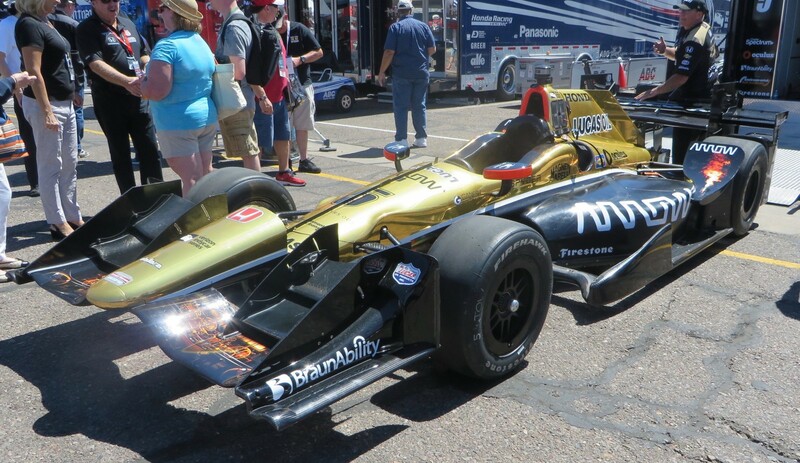 The No.5 Arrow Schmidt Peterson Motorsports Honda crashed by James Hinchcliffe in the first Friday practice was repaired in time for Hinch to get in a few laps during night practice, and it’s ready to go. Carlos Munoz crashed in qualifying so will join Hinchcliffe and Sato at the back end of the grid. Munoz made it out for the full night practice with 44 laps on the repaired car. All the IndyCars had an in-out Systems Check Lap mid-afternoon. Sato got an additional five minutes to test his car. When I went for my Saturday morning Chevrolet Event Car ride with Larry Foyt as driver, I could see the skid marks on the track from all the accidents; but the SAFER Barriers had been painted overnight and were pristine. And glad we all are that PIR has installed them circuit-wide. 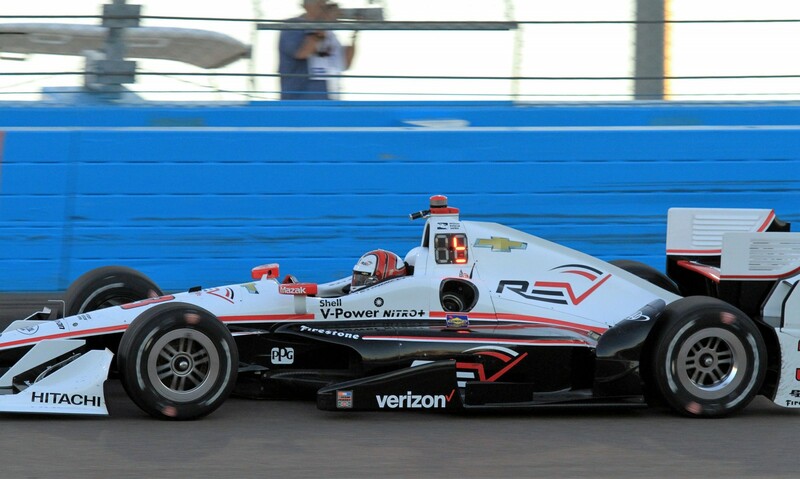 Helio Castroneves won the Verizon P1 Pole Position Award for Saturday night’s race. He won the PIR race from the pole in 2002 and is going for a repeat. 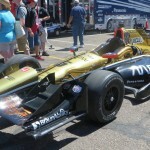 This entry was posted in Indy Lights, IndyCar by Lynne Huntting. Bookmark the permalink.